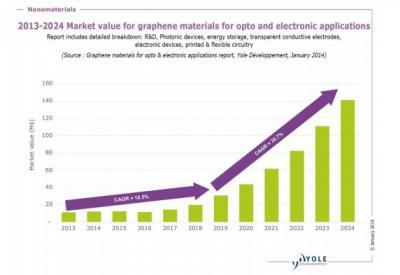 Yole Developments released a new graphene market report, in which they forecast that in 2024 the graphene material market will reach $141 million, driven mainly by transparent conductive electrodes and energy storage applications. According to Yole, the market in 2013 was about $11 million, and it will grow slowly till 2017. In 2019 the market will experience faster growth (35.7% CAGR).